Perpignan caretaker coach Bernard Goutta has appealed to supporters to remain calm after the Catalan side slumped to a 35-16 hammering at home at the hands of Stade Francais. The former flanker took charge of the club alongside Christophe Manas last week following Jacques Delmas' sacking after a string of disappointing results but Saturday's defeat leaves the club just six points off the relegation zone. Speaking to Midi Olympique, Goutta said: "We're going to try and rebuild this group and restore some confidence. Don't lose hope. We know we're in a nightmare scenario but we'll do everything we can to get out of it." 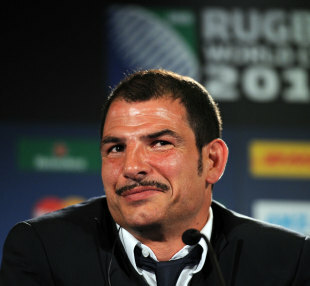 Elsewhere, Le Monde reported that former France coach Marc Lièvremont could be in line to succeed Delmas. Montpellier captain Fulgence Ouedraogo believes that there's a lot more to come from last season's Top 14 runners-up after disposing of Clermont Auvergne 29-23 at Yves du Manoir. "We actually played better against Leinster and Bath than we did [against Clermont]," Ouedraogo told Midi Libre. "We were actually a bit nervous and disorganised at times. But at the end of the day, we won the game. That's what we've got to take out of it. "I never felt the team were in danger, even towards the end of the game when Clermont came back strongly. It's true that we were starting to crack a little but we managed to hold out. Clermont got a bonus point and we won. Everybody's happy." Castres had rookie fly-half Pierre Bernard to thank after his last gasp 45 metre penalty secured a 22-22 draw with Toulon at Stade Pierre Antoine. Jonny Wilkinson looked to have secured victory with a 17 point haul for les Toulonais but Bernard's last minute strike prevented a fourth successive defeat for the home side. "We've got a team with two faces," Castres coach Laurent Labit told La Depeche du Midi. "We did a couple of good things in the first half but the problem came when we had three or four spells of possession on the wet pitch, we got ourselves in trouble by losing the ball."